My almost four year old daughter loves to run and check the mailbox. She also loves to write (okay, draw) little notes for everyone. The two loves come together with this super easy felt mail carrier set. Dust off the sewing machine and scavenge for bits of left over felt and you're on your way! 1. Out of blue felt, cut the following: one 11x12-inch rectangle, one 9x12 inch rectangle, and one 5x12 inch rectangle. 3. 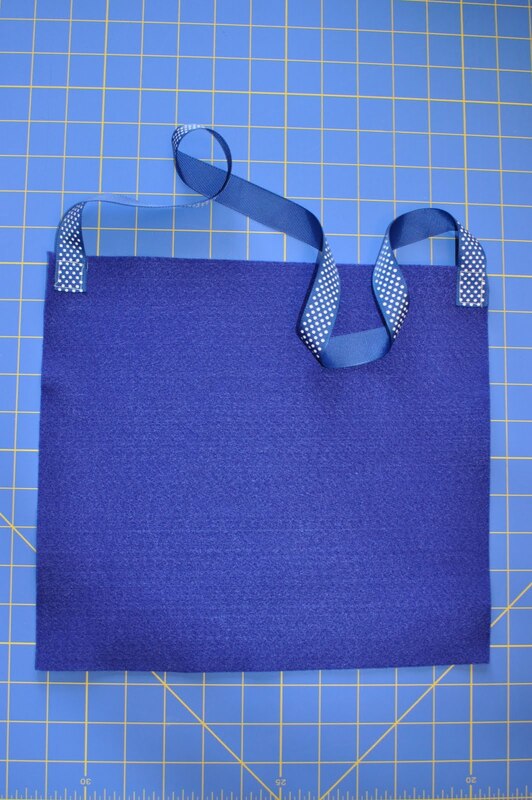 With wrong sides together, stitch the sides and bottom of the blue 9x12 and 11x12 inch pieces together. Lay the blue 5x12 inch piece on the un-sewn edge of the 11x12 blue piece and stitch. Starting to see the bag? Good. 4. Securely stitch the length of ribbon or webbing to the back top corners of the bag forming the strap. 1. Out of the white felt, cut the following per envelope: one 5x8 inch rectangle, one 4x8 inch rectangle, and one 3.5x8 inch rectangle. Out of red felt, cut the following per envelope: one 1/5x1/5 inch square. 2. Cut a point in the 4x8 inch rectangle to form the flap of the envelope. Really, you can eyeball this. But I measured 1.5 inches down from the side edges and then cut in to the center from both sides. 3. On the 5x8 inch white rectangle, place the stamp about 1/4 inch from the corner of the envelope. Stitch in place with red top thread and white bobbin thread. This hides the mess of thread on the inside of the envelope. Swap your top thread to black and set your machine to zigzag. Zig zag the address and return address. No need to be precise there; it's just an abstract interpretation of the text anyway. Hint: I stitched all the lines of the address without stopping to cut my thread in between. I just lifted the presser foot and turned my fabric then dropped it again, trimming all the threads at the end. It just seemed like way too much work to keep clipping. It may ravel a bit, but I'm totally okay with that. 4. With wrong sides together, stitch the sides and bottom of the white, now stamped, 5x8 inch and the white 4x8 inch pieces. Lay the trimmed, white 3.5x8 inch envelope flap on the un-sewn edge of the x8 piece and stitch. Have you got an envelope? Fantastic! I love finding these envelopes on my pillow with little love notes inside. I happen to think that they were delivered by the cutest mail carrier ever. I love this! I love all things felt. This is adorable. It would be cute for Valentine's Day too. So cute, Teishi!